Thread: Victory over DACA Amnesty now in sight! 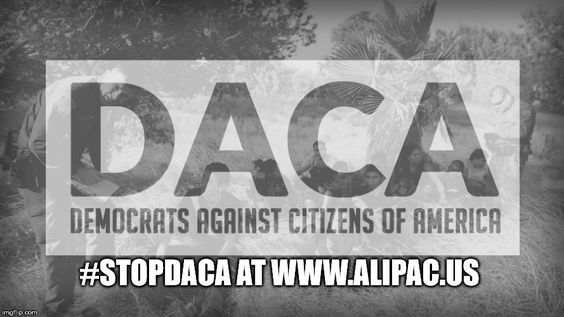 We are happy to report that the government shutdown has created a crisis that has opened a door of opportunity for us to #StopDACA, Please donate and share our new viral memes below within next 24 hours! We plan to release our new strategy to try to return the Trump administration to the campaign promises made to enforce our existing immigration laws with strong deportations tomorrow morning! Our fresh strategy can hit them hard, but only with your financial and volunteer support! And please share our new Meme going up today! Let's all fight hard today ALIPACers! We've beaten Amnesty legislation several times before and we wil do it again in 2018! PS: Major thanks to all of you fighting hard to stop the DACA, Dream Act, and Comprehensive Amnesty dominos from falling and bringing life as we know it in America to an end. If the elites defeat us this time, none of our lives will ever be the same. Please donate now if you can while we still have a fighting chance! Last edited by ALIPAC; 01-21-2018 at 02:42 PM. Beezer, grandmasmad, southBronx and 2 others like this. don't our President have right to fire the Dem Over for what they did( Put the illegal Immigrant's be for us . )some one ask me this & I did not know for sure . Beezer, ALIPAC, GeorgiaPeach and 3 others like this. Great memes Alipac. 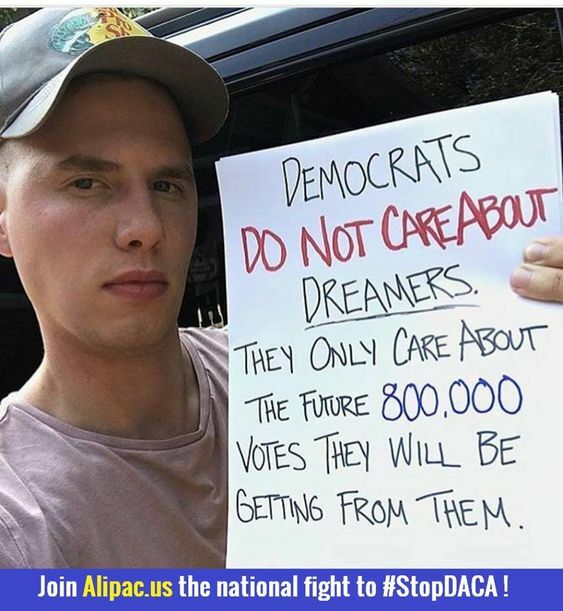 I like the word change for DACA. And let's educate the public that these @800,000 illegal aliens are mainly adults up to 36 years of age and they have children (anchor babies) so we are talking about millions of people who benefit from amnesty. With or without parents getting amnesty it is still millions. Virtually all of these people will be democrat voters. Why are the president and republicans not talking about ending birthright citizenship, another magnet of illegal immigration to end. Our border is so porous and immigration laws are not being enforced. If it was more secure the sneaking in numbers would be a trickle and hopping on planes to be jetted around the country through 'Catch and Release" would not be happening. There is no room at the inn (detention centers) they say so our unsuspecting communities are drop off points and American citizens are the losers. Who decides where they go? Is it some liberal Obama holdover who knows which areas, which states need demographic changes, that need future democrat voters? Hi southbronx. I am sure Mr. Gheen will answer you soon. Judy and sisyphus959 like this. WE DO NOT WANT THE 8TH AMNESTY! THE COSTS ARE ON THE BACKS OF U.S. TAXPAYERS! PEOPLE MOVE ALL THE TIME...SELL OUT, PACK UP AND GET OUT! GeorgiaPeach, grandmasmad and Judy like this. We would hope so Southbronx, but nothing in Washington works the way it is supposed to for us. Push into the NIGHT! Victory in SIGHT!